While safety is a topic that requires attention and focus every day and every second, National Safety Month in June is an ideal time to rally employees around a theme. By holding safety meetings with every member of your organization, you are placing emphasis on the importance of on and off the job safety. You might be a well-coordinated person, strong and in control of your body, but you could still fall down. Falls are the number one cause of injuries in the workplace. Review these tips and hazards to refresh your memory on fall prevention. In a plant, warehouse, or office, the most common causes of falls are tripping and slipping. Dry the floor after spilling any liquid. Don’t just wipe it up; wipe it dry. Watch where you are going so you can spot anything that could trip you up. Don’t carry anything that blocks your vision of the walkway. Get help. Don’t string a temporary cord across an aisle or walkway. If you have to do it, mark it clearly so others don’t trip over it. Be aware of single steps and uneven surfaces. Don’t run or rush through halls or aisles. Take steps one at a time and use the handrail. Sometimes people think that because they don’t climb ladders or work where they could fall from a significant height, they don’t have to worry about falling. Actually, people can be seriously injured when they fall just a few feet. Never rock on the back legs of a chair. Be careful when you use a step stool to reach up to a shelf. 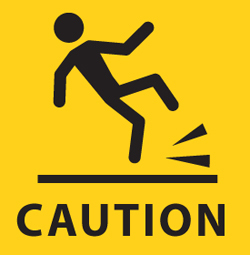 One NIOSH study indicates that falling one, two or three feet can cause a serious injury.